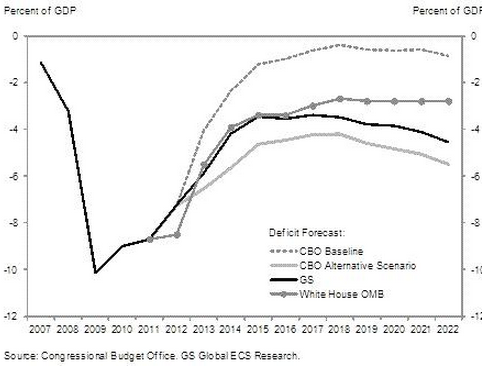 Goldman's latest analysis of the US budget shows a staggering gap of $8 trillion in the next 10 years. This materially diverges from the latest White House projection as well as from the CBO's "baseline". GS: - Through 2022, we forecast a cumulative deficit of roughly $8 trillion (3.9%) under a "business as usual" assumption that envisions extension of most current policies but no further deficit reduction measures. The question of course is whether Goldman's nightmare scenario could be altered by the "changing of the guard" in Washington. The answer isn't entirely obvious. The US government clearly needs to shrink. But according to Goldman's model, increased "austerity" - which would presumably be a policy of the Romney Administration - is likely to slow economic growth and reduce tax revenue. The lower tax revenue would offset lower government spending. This is something we may unfortunately be already witnessing in Europe (Italy for example). GS: - The two main risks to the forecast are related, but work in opposite directions. First, there is a clear possibility of greater fiscal restraint than we assume in our forecast [presumably due to a change in Washington]. While we assume that most of the spending reductions enacted in 2011 will be maintained, we make no assumption regarding the enactment of another round of deficit reduction measures in 2013. The second risk, working in the opposite direction, is that growth could come in under our forecast, particularly if the first risk--tighter-than-expected fiscal policy--does indeed materialize. This does not bode well for the US public debt levels going forward no matter who is in the White House. 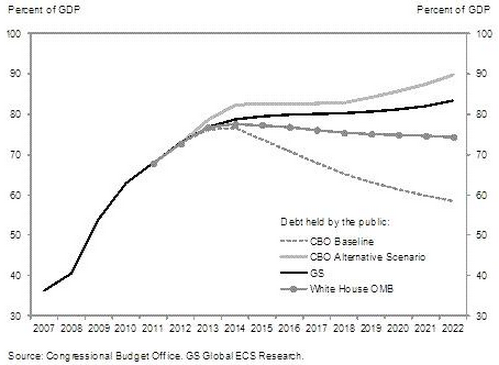 The following chart shows Goldman's projection (compared with the White House and the CBO) of the US debt to GDP ratio - creeping toward mid 80s. A number of economists unaffiliated with the government or with GS think Goldman's forecast is quite realistic and may in fact be a bit optimistic.